Oh %#&amp;*! Just how Common is Cursing in the Workplace? Oh %#&*! Just how Common is Cursing in the Workplace? How common is cursing in the workplace? And more importantly, how do certain words affect you or your job? According to a survey by CareerBuilder this past July, 64 percent of employers reported they would think less of an employee who repeatedly uses curse words. Fifty-seven percent reported to be less likely to promote an individual who swears in the workplace. At 57 percent, men are more likely to report swearing at work; only 47 percent of women reported the same. 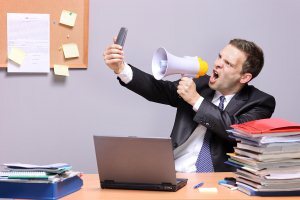 Younger workers were the least likely to use profanity while at work, yet employees 35-44 years old were the most likely to curse in the office. Many employers reported they’d think less of an employee who heavily uses profanity in the office, but one in four employers, or 25 percent of respondents, also admitted to swearing at their employees. Twenty-eight percent of workers reported swearing at their colleagues. Using profanity at work, of course. According to Merriam Webster’s dictionary, profanity means the use of profane language. Other terms include four-letter-word, expletive, curse, swear, cuss and swearword. Half, or 51 percent, of workers admitted that they swear while in the office. Almost all of them (95 percent) also reported cursing in the presence of their co-workers, while another 51 percent said they cuss in front of their bosses. At 13 percent and 7 percent, respectively, senior leaders and clients are the two groups employees are the least likely to use profanity around. Our nation’s capital, Washington D.C., reported the most employees who were most likely to curse at work. Denver, Chicago. Los Angeles and Boston made up the top five cities. Most employers will automatically think less of an employee who uses profanity at work. But why? I found the survey to be quite interesting. In a society filled with profanity from everyday TV shows to music to casual conversations, it seems like cursing, at least the “not as profane,” words are accepted. But just as, in most cases, it’s unacceptable to dress everyday casual at work, should the use of curse words be held to the same standard of professionalism? Is it justifiable for an employer to think less of an employee who curses, especially if managers curse themselves? I am interested in your thoughts. Do the survey’s results reflect your company’s views when it comes to cursing? How often, if at all, is profanity used in your office?